In this third episode of the Collective Wisdom podcast you’ll learn about what it’s like going from the world’s largest company, Apple, to the smallest possible company, a single-person startup. After decamping from Cupertino Holly Shelton raised over a million dollars to start MoveWith, the Airbnb for fitness. Listen and you’ll learn about how to decide what to pay yourself when you’re the boss, why being CEO is one of loneliest jobs you can imagine, and what it’s like pitching the iPad in front of Steve Jobs. Full disclosure: I’m a proud investor in MoveWith. In this podcast we spend a lot of time talking about what it’s like going from a big, iconic company to a teeny startup, but I wanted to explain what got us so excited about MoveWith in the first place. Holly worked in one of the most high-pressure environments imaginable — Apple under Steve Jobs. She managed teams that developed the new Macbook product line and coordinated global product launches. She got to talk to the press about wildly anticipated projects. 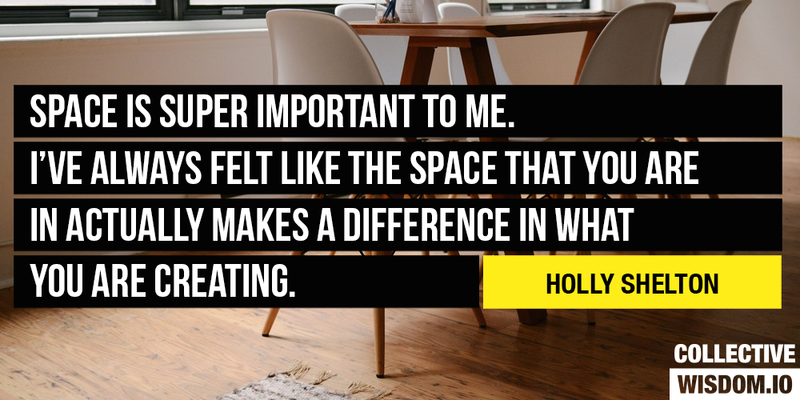 While most people would kill for a job like this, Holly wanted to build a new venture from the ground up around her personal passion of fitness. There’s been a tremendous amount of innovation in the fitness space in the last couple years. The all-you-can-eat ClassPass model has earned rave reviews from users and massive valuations from VCs, though in our diligence we heard that not all studios were as enthused. SoulCycle brought disco/club-type production values to spinning classes. 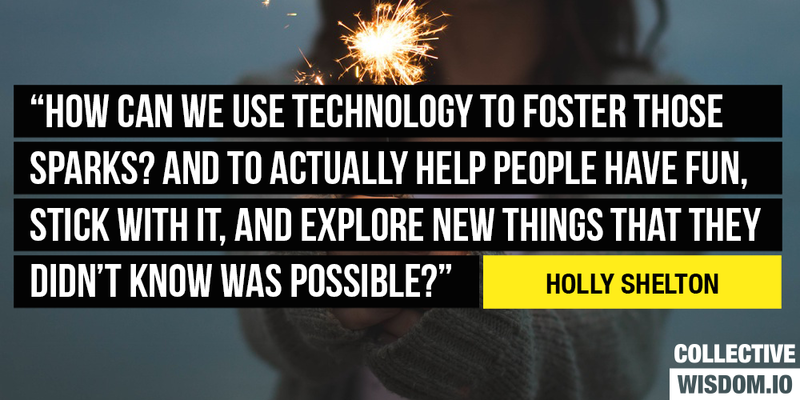 But Holly saw that most startups were focusing on the space or equipment, not the teachers. In her experience the teachers were the lifeblood of classes and so she set out to uncouple locations in teachers. By focusing on this underserved segment, she’s created a growing team of trainers who act as advocates for her business. As a side effect, this lead to the creation of an amazing line up of innovative classes. Instead of doing yoga in a stuffy gym, MoveWith instructors find interesting spaces like churches and nightclubs to offer their courses. Some use this uncoupling to make classes even more convenient, by holding them in the workout rooms of apartment buildings, for instance. Additionally, the types of classes getting created are totally unique — from multi-day retreats to run + yoga classes. A MoveWith kickboxing/yoga class in an old church. Even though she worked at the highest levels of technology, moving from a massive hardware company to a nimble software-based strategy is risky. Apple could seemingly summons the world’s experts in any field to help on its products. And despite her passion for fitness, Holly had never managed all of the functions of a business. Holly recognized these risks and sought out ways to prove that they wouldn’t be insurmountable obstacles. Holly knew that she’d need advisors to support her on the MoveWith journey. To supplement her business expertise she recruited Michael Horvarth, the Co-founder/CEO of Strava, who has very relevant experience in the type of business she was trying to build. She joined Project11’s accelerator withKatie Rae to help build out the product, hire talent and refine the business model. When it came time to find engineers she recruited people fromEventBrite an Apple to build out the vision. We couldn’t be more pumped to have backed Holly and the MoveWith team (along with Project11, Launch Capital, Blade, & Scott Belsky) and can’t wait to see them cross the finish line. Don’t have time for a podcast? You’re in luck! We have also prepared a transcript with links, highlights, and other audiovisual elements for your skimming and sharing pleasure. 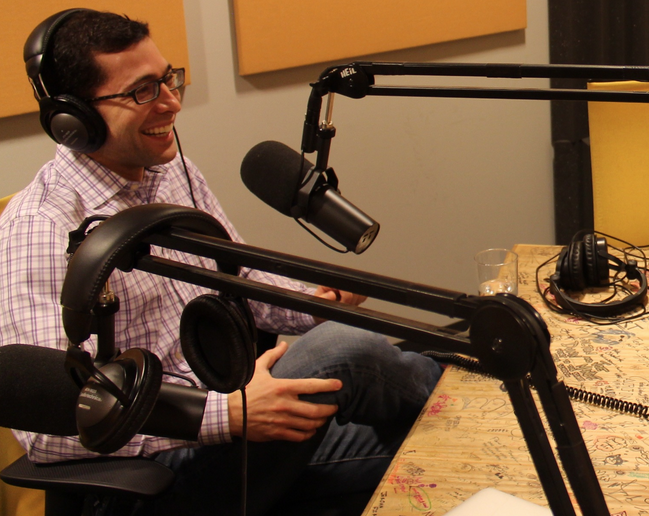 Micah Rosenbloom is the host of Collective Wisdom and a Managing Partner at Founder Collective, an early-stage VC firm that has invested in companies like Uber, Buzzfeed, and Hotel Tonight. Hi listeners. I’m Micah Rosenbloom, host of Collective Wisdom, the podcast where we get busy bringing you lessons from strong founders, to help pump up your startup. I’m a venture capitalist with Founder Collective, we’re a seed stage VC firm that is invested in companies like Uber, Buzzfeed and Hotel Tonight. Today we’re going to be talking to Holly Shelton. She’s the founder of MoveWith. A company that turns the world into a workout club. Imagine a yoga class in a club that hosts raves. Or if you favorite teacher taught classes in your apartment building work out room. That’s basically what Holly’s building. It’s a bit like Airbnb for fitness. Now, admittedly we’re biased, I think this is a brilliant idea. We’re now proud investors. This was a big risk for Holly. Before starting MoveWith, she was at Apple. Where she was product manager in charge of the MacBook computer line. You might be listening to this podcast on one of her computers. She worked with some of the most brilliant people in the world and her decision shaped the way millions of us work. Probably many in the tech world would kill to have her job. Holly was also a competitive skier. She loved fitness and thought there was a better way to bring product to market. That entrepreneurial fire burned deep in her, she decided to give up that kush gig at Apple and start MoveWith. We’re thrilled to talk to her today about what it’s like pitching Apple products in front of Steve Jobs, the dramatic changes in the fitness industry that led her to found move with, and what to do if you chip your tooth in route to a pitch meeting. Micah Rosenbloom: Holly, great to see you. Holly Shelton: Great to see you too, Micah. 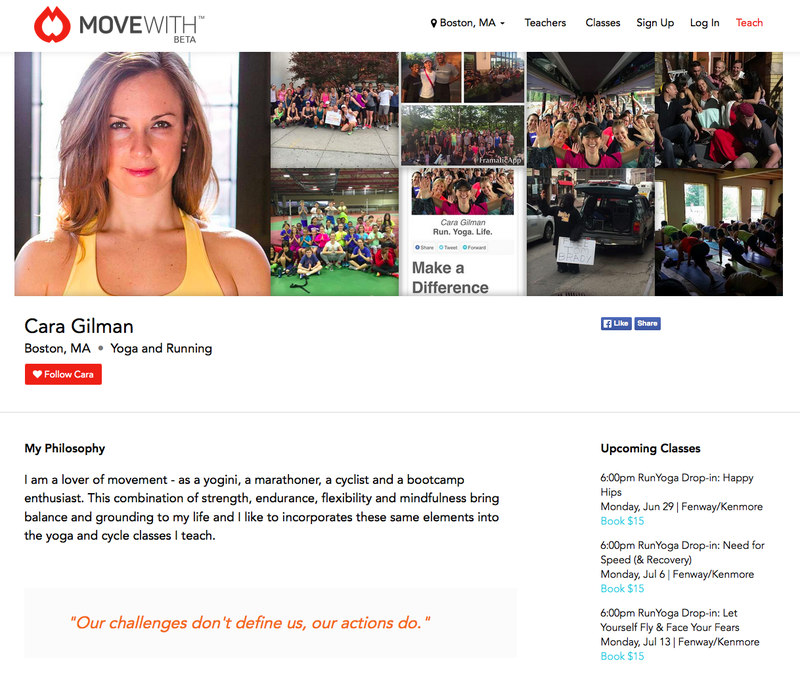 MR: I’d love to hear a little bit about MoveWith, and what inspired the idea for the company. HS: We’re creating a platform for fitness and wellness professionals that makes it easy to be an owner without studio walls. For consumers, really connects you to the spark, the person that inspires you, that leads you, not just to a temporary healthy body, but to a healthy lifestyle that lasts. We’re empowering teachers to host all kinds of classes in all sorts of interesting unique spaces. Imagine doing yoga on a rooftop at sunset, rave yoga at the Oberon Theater in Harvard Square with 300 other people and having a drink after. Or run yoga where you run really hard for 45 minutes on the Charles River and finish with candlelight yoga in an office space. MR: That’s awesome, I’m totally joining that class. You mentioned that a lot of this is about focusing on the teachers, and letting the teachers build their own business. Do you view this as a platform for the teachers to market themselves to students. HS: There’s nothing out there right now that’s really for the teacher, and when you look at, if you go to yelp right now, and you type yoga instructor, you’ll find thousands of yoga studios. When you actually read the reviews, what people are talking about are the teachers. Yet, there’s no way for someone to find that teacher, that’s really going to connect with them, for the teacher there’s no way for them to grow their business to be an owner without studio walls, to actually have a legitimate career out of this, and to unite their track. We’re really enabling them to do that, which is what we ultimately believe, for the consumer, is going to be the most meaningful way to have an active life. MR: Is this Airbnb for fitness? HS: Yeah. It’s exactly Airbnb for fitness. When you think about fitness, there’s no reason that fitness has to happen in studio walls. Of course, it will happen in studio walls, many of our teachers will be owners of a studio. Fitness can happen anywhere. It can happen in companies, in apartment buildings, outside. It’s really about giving them the tools that they need to do that anywhere. You really imagine your city as one large studio without walls. MR: How do you deal with things like cycling, or weights, where you need some equipment in order to have the class. HS: Many of the classes that are happening outside the studio will be equipment-less. Right now a lot of the training that’s happening is body weight intensive. You’re using your body weight as resistance. For most fitness, you don’t’ actually need equipment. When you do need equipment, we are working directly with studios to enable teachers to book right into studios, but still be owners of their own class. MR: Prior to starting MoveWith, you worked at Apple, and worked on some pretty exciting products. Tell us about that. HS: I managed the MacBook product line. Macbook Pro, and MacBook. My job was product management, product marketing, global. So managing the product from concept through to end of life. MR: What was the culture like at Apple, as you remember it. HS: Apple is just a crazy culture. It’s both the most incredible place to work and the most insanely stressful place to work. It’s a culture of perfectionism, it’s actually a place that creates lifers. I went to Apple thinking I would be there for a couple of years, and go start something. I ended up being there for 5, which for me was a long time. I looked around me, there were people who had been there 25, 30 years. It’s a company that people can’t leave. MR: What happened that was so amazing. Was it when a new product would be introduced and Steve was on stage, all those years of work finally revealed to the public. HS: It was definitely that. My first really big launch was launching the MacBooks with retina. Which we’d worked on for so long. Actually, the way Apple launches products, the unveil it to the world, across every channel in one moment. You have all the engineers that worked on it, the whole team is there, there’s nothing more gratifying than seeing consumers start cheering, applauding, purchasing it. It was also little things, like being in a room, we had this room with the human interface design team that was all white walls that you could draw on, having these aha moments with these brilliant people that are creating something, really pushing the envelope of what’s possible. MR: You worked on the iPad as well. HS: I was part of the launch of the iPad. This was my very first launch at Apple, where I was allowed to be an Apple spokesperson, which technically means you’re just speaking to the press about this new product. Steve had just finished his keynote, we’re in the staging room with all the demo devices, they had told us ahead of time that they were two big journalists here, who were obviously David Pogue and Walt Mossberg. Of course, Walt Mossberg is the very first person who walks right up to my station. HS: He starts grilling me with questions and the next thing I know I turn to my left and Steve Jobs is just standing there listening to me. In that moment I was like, “Oh my god I’m going to get fired.” He let me talk for probably 20 more seconds and then interjected. I got to stand by his side, for the next 15 minutes while he told Walt Mossberg why the iPad was the future of computing. MR: Did Walt buy it? HS: I believe Walt wrote a very good review, so. I think he bought it. MR: Steve was absolutely right. What elements of this culture do you want to bring to MoveWith, are there elements that you’re trying to keep out, that are unique to Apple but don’t belong in a startup. HS: There are definitely things I want to keep, the thing that drew me into the Apple culture was this simultaneous hunger and drive, combined with playfulness and curiosity. It’s like the classic Steve Jobs stay hungry, stay foolish. That is embodied throughout the entire culture, I think it’s really powerful. It’s a culture of excellence, which I think is important. Those are things that I want to keep. I believe that leads to incredible things happening. It’s also a culture of perfectionism and not leaving a single corner unturned. Which is why they have incredible products, you don’t have the luxury of as a start up. For us it’s about moving quickly. I also think that there is a humility and a realness that we’re bringing into the company, a playfulness that’s more about activities and being outside. We are hiring people who are living and breathing the brand of what we’re creating. MR: It’s interesting, as a startup MVP rules. The minimum viable product, you just want to get something out there, get users using it, it sounds like at Apple it really is about getting the product exactly right, and then blasting it from the hilltops. It seems like that’s actually a very different experience and you have to change the way you think to run a start up. MoveWith started with an MVP, but is quickly turning into a fully-featured app on the web and mobile. HS: It’s totally different. There was no such thing as an MVP at Apple. Not even remotely. The pace at which you’re putting product out in front of people is completely different. It’s been an adjustment for me. Our very first product was very much an MVP. I built a webpage with all these lovely tools that they built for non programmers. It was terrible and ugly, I was so. It was not something I was proud of, yet people used it. The point of a start up is to do as best you can with as little as possible. That’s the exact opposite of what you do at Apple. MR: Does that impact the kind of people you hire. At a place like Apple, you want specialists, I’m thinking about the keys, the track-pad, every component, there’s an expert for each of those, whereas in a startup, is it more about good athletes, and good players on the team. HS: Definitely. Apple had the luxury of having experts on every single part of these machines. When we were working on the new MacBook, we wanted a new type of fan that would be quieter, that was more efficient, and we found, we had the resources to go and find the guy who was doing his PHD on asynchronous blades, bring him to Apple, and he spent, I don’t know, a long time designing fan blades that go into a MacBook Pro. Now, I have a million dollars and I’m trying to recruit people who can wear 10 hats at one time and not be focused on the tiniest of the little details. 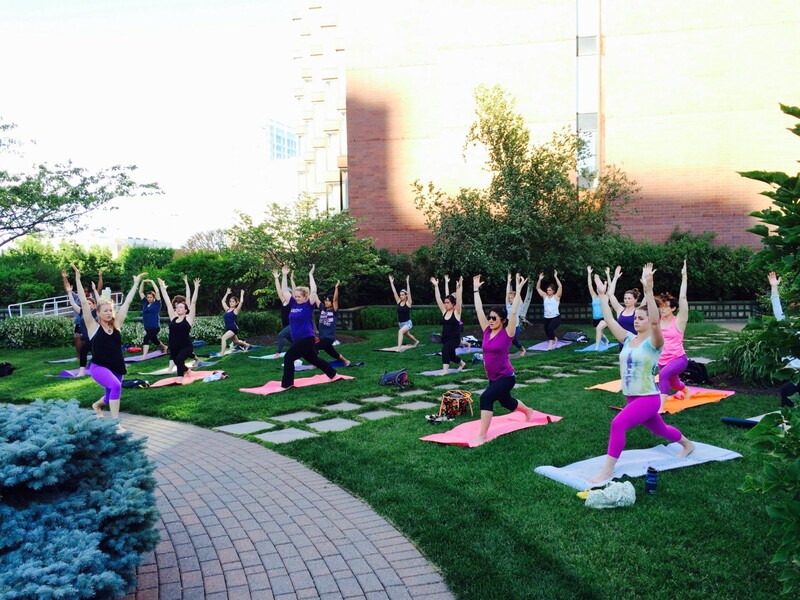 An example of an outdoor class. MR: Is there a PHD in rave yoga that we can go out and find. HS: I think we have one, we’re finding one. MR: What was it like raising the money. You mentioned you have a million dollars in the bank. How did you get it, what was that process like. HS: Stressful. You know, we were raising money with no product, mostly on an idea. We had done a market test, it was about convincing people about this crazy idea that didn’t exist, with a very small team at the time. For me it was just about finding people who got it, and believed in what were doing. It actually happened pretty quickly, but it was definitely a learning process. MR: I feel like the fundraising process is glamorized as this awesome thing where you go around Sandhill road and get lots of term sheets. Was it that way for you, or were there some not so great instences. HS: I didn’t experience fundraising as being glamorous. It’s racing around from fund to fund, sitting it boardrooms with this, you meet the assistant, and then you get coffee, and then you go and meet, set up your deck. We were racing around, I was so busy. Through the process we were on our way to, actually I think this was our first pitch, and we were in an Uber, had just got off the train. They had the suckers, the ones that have cherry and chocolate. I haven’t had them since I was a little kid, and I got all excited. MR: You’re a true Mid-Westerner calling them a sucker, by the way. A lollipop. MR: For those on the East coast that listen to this. HS: I took my first bite in and I feel my tooth crack. I didn’t even tell my co-founder what had just happened because we were like racing into this meeting that we’re running late for. I had to give my whole first pitch with my tooth half broken, ended up getting a root canal a couple of days later. MR: Did you get a term sheet out of it at least, from that pitch or no. HS: I did get a term sheet. MR: You have a million dollars in the bank, where is it deposited, by the way. HS: It’s deposited at Silicon Valley bank. MR: So a plug for Silicon Valley bank. No you have to preserve it, this is your life blood. One of the things you have to decide is how much to pay yourself, pay the staff. How did you figure that out. HS: It’s really hard, a million dollars goes really quickly when you start bringing people on. MR: A lot of people think it sounds like a lot of money. In actuality for an operating business. HS: For an operating business. MR: It can go really quickly. HS: It can go really quickly. It was part math, how many people do we need to hire and how long do we, what’s the runway that we think we need. Part hunger and pride, all the stories you hear about people who don’t pay themselves a lot of money in the beginning. Literally making 25% of what I was making at the moment. Most of my team I’m bringing in, they’re making half of what they were making. I actually never even think about it. I believe so strongly in this, its about finding people who are willing to take a risk and are willing to believe that the equity that you’re giving them. You have equity here that you don’t have the power of giving at a place like Apple. You get RSU’s but it’s different. It’s about finding people who believe that this is going to be really big, and are willing to come in and take a risk for a couple of years. MR: So if you meet a great candidate, and that candidate says to you, “But I need X amount of money in salary.” Is that a tell that it’s the wrong person for this job, or is it different at different levels of staff. HS: If someone is super hyper focused on salary it’s probably too early but I still actually try and explain to them why they should think about this differently if it’s candidate I really want. I actually just had that scenario, I was able to negotiate her down to a salary that we could chew, and give her an amount of equity that she was happy with. She’s 3 days in and I think it’s going to make a huge difference for our company. HS: Exactly. We’re looking for that exact same thing. People who clearly believe in this, and are willing to put their money where their mouth is. MR: We talked a bit about Apple, and I imagine they have a pretty serious review process. Is it an annual process or feedback session. HS: They do score you, yes. Across the company values. It’s a pretty rigorous process, both upward and downward feedback. MR: Are you going to use a similar feedback process, or do a feedback process at all giving hoe small you guys are. HS: You know, we’re tiny right now. I’m an absolute believer in feedback. My boss at Apple I think was very annoyed at me in the beginning because I constantly was asking for feedback. I actually think that people need feedback and do best when they’re getting feedback so I would like a culture of feedback, but maybe in a much less structured manner. MR: Tell us about finding office space, building the physical outfit for the company and starting, I know you’re in kind of an incubator set up. Tell us a little bit about where you’re going, because I know it’s both a change of office space but also geography. HS: We’ve been working out of one of our investors space, free office space for now. Which is perfect for us. MR: How’s it been searching for office space now in San Francisco. Is it a bit like hunting for an apartment when you’re not yet in that city. I’m certain it’s not going to be quite the space that Apple is building in Cupertino. HS: It’s certainly not going to be the space, even the space Apple has now, which is nothing like the spaceship that’s being built is amazing. You have every resource you would ever want there. MR: Lots of free clipart. MR: Does it make corporate parks, which I know are the least desirable, least in line with your culture, where you want to be, but at the same time you need the flexibility to grow and as the company scales and you can’t sign 10 year leases. MR: Is that appealing, or are you going to try to find that kind of perfect lofty space in Oakland. HS: It’s super unappealing for me. Space is super important to me. I’ve always felt like the space that you’re in actually makes a difference in what you’re creating. Actually, the other day my designer, this is just space in her computer, but she was talking about this program Sketch and designing in Sketch vs designing in PhotoShop, and actually the output of what she creates is very different depending on the program she’s using. I believe that that’s true for people’s creativity and how they’re thinking in a space too. We’re trying to optimize for the best possible co-working that has light, and feels good. MR: Holly, what’s been the most surprising thing that you face now going on your own, having left Apple. HS: Everyone always said being a CEO is lonely. I never quite understood it, actually isn’t an incredibly lonely job, that’s been surprising for me. Especially being the CEO of a company that’s small. I have 10 jobs. I’m our HR head, I’m our Head of Finance, I’m dealing with setting the bank account, and dealing with incorporating, finding snacks for the office, all of these things that someone else did in my old job. MR: Holly, you mentioned that being a CEO is lonely, I’m curious if that is actually, you feel isolated, or in some ways, you feel a lot of pressure to make decisions, you get a lot of input, it’s sort of a lot of cooks. In the end it’s your decision. Is that kind of where the lonely feeling comes from. Describe it for us. HS: I think that is. At Apple, I was in charge of a lot, but at the end of the day I always knew, if I was making recommendations, and there was someone above me that if, the fan, it was their fault more than mine probably. At Apple, I always felt like I knew exactly what I would do if I were running the company. When you find yourself actually running the company, you realize exactly that. That there are a million voices in your head, there is literally no one that is going to make this decisions but you. It almost doesn’t matter how much advice you get, in the end it’s all about your gut. Of course data is going to inform that gut. Steve always said that and I never fully appreciated it until I’m now in this role and I’m obviously at the very very beginning of what he experienced. It’s very different. MR: Sometimes you question your gut. Steve, I don’t think questioned his gut very often, he was right many many more times than he was wrong. As a first time founder, it’s sometimes hard to trust your gut. HS: Yeah, sometimes its really hard to trust your gut. Especially when you’re surrounded with people who have done this before and are seasoned entrepreneurs or board members, or investors who have opinions, maybe your gut says something different and you question that. MR: Do you feel like you get a lot of conflicting advice at times, whether from the board or from other customers, or trainers on the platform. HS: Yeah. You’re constantly getting conflicting advice. For me its about, it’s always about getting the nugget of the advice and starting to pattern match and figure out from there what is true and makes the most sense for you. MR: Now that you started MoveWith, what didn’t you know about going into the foudning of the company. HS: There were so many functions that you have to cover when you’re starting a company. Everything from being your legal expert or finding someone that is, to understanding the insurance industry and we have people who are taking fitness classes, of course it’s important that we have insurance. These are things that you absolutely have to have when you’re sending people into an activity like yoga, or running. MR: So Holly, in an hour and a half, you have your second board meeting here at the office, are you nervous for it. HS: I’m much less nervous than I was the first time. The first time I was nervous mostly because I didn’t actually know what happens in a board room. I remember trying to start thinking about putting my slides together, I think the meeting was on a Tuesday, I started thinking about it on Friday. I’m way too busy to think about this in advance. I called a coupe of friends and I was like, “What goes in a board deck.” A coupe of friends sent me their copies, they sent me some blog posts that Kleiner Perkins and some of those guys write. I put together a deck that seemed reasonable, and covered the key strategic issues that I wanted to discuss. Actually I found the board meeting to be helpful. Which is not what I’ve heard about from others. MR: Was anyone aggressive in questions and say, “You’re wrong,” or “Can you show my more data on that point.” Or did you find it wasn’t that environment. HS: I didn’t find it so aggressive actually. I think we have a pretty friendly board. People have opinions, which is great and push us. Not in a, I’m coming from Apple, I’m used to very aggressive culture, I’m used to, the very first time I presented to exec at Apple I was warned that I would be yelled at very early in the presentation. Sure enough, within 60 seconds, an eruption happened. I’m used to aggressive. MR: Holly, we talk a lot about disruption, at Founder Collective we like to invest in companies that are disrupting traditional industries, Uber is disrupting the black car, taxi. Maybe to some extent the rental car business. We’ve talked about Air BnB, what’s going on in the fitness industry that makes it right for disruption in your eyes. HS: The fitness industry is been going through a massive shift in the past 5 years. It used to be everyone was going to the big bucks gym. Then you started to see the emergence of the studio happening, so you now see 25,000 yoga studios across the country. You see 10,000 corssfit studios across the country, an emerging amount of boutique stuff popping up, with this has been this a massive explosion of trainers and instructors of all various sorts. Its becoming more and more fragmented. There’s a hunger on the consumer side, especially for group fitness, that I don’t think we’ve seen in quite some time. 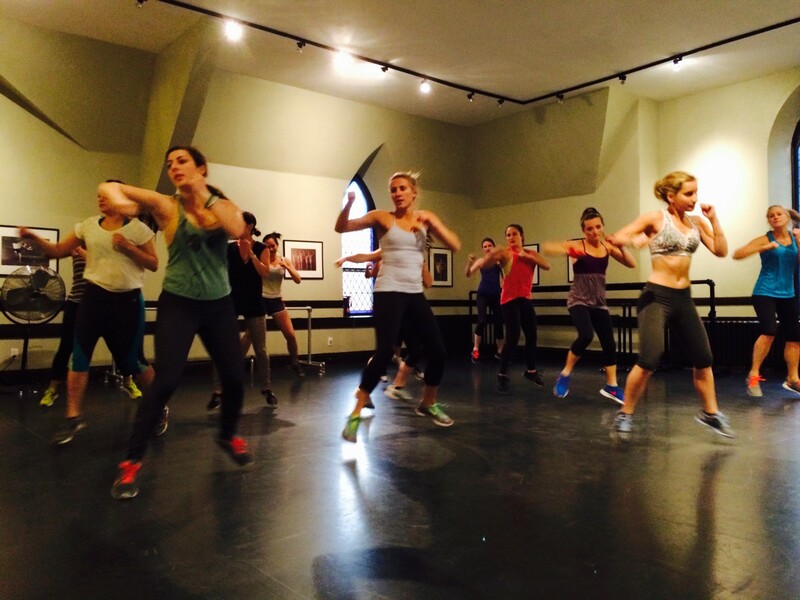 Even at places like Equinox, the people that are going there, are going there often for group fitness. There’s a hunger of people to be lead by somebody and do something together. It’s mass for, it’s right for disruption because of those trends, and then simultaneously, the thing with owning and gym is you have high fixed costs, you only have high utilization at certain hours of the day. It’s really business that for a lot of people doesn’t make sense. When you start thinking about how can you disrupt this high fixed cost problem, you start thinking about what really fitness happen anywhere, why don’t we just take that out of the equation. Strengthen your starup skills by subscribing to the Founder CollectiveNewsletter! MR: We’re an investor, obviously, in MoveWith. One of the things that really hit home for me was this notion that a lot of instructors, as they gain a following, go out, they want to be entrepreneurs, they buy their own studio, rent their own studio. That’s when they get into trouble financially, because owning a studio is a huge financial burden. With the exception of maybe 7am to 10am, and maybe 3pm to 7pm it’s vacant. How does that insight trigger MoveWith and what you’re doing. HS: That’s exactly what we saw. We started following the evolution of a teacher’s career and she always starts off getting certified and then she teaches at studios, slowly she starts to get prime-time slots, and then at some point she realizes that in order to make a living, she needs to either become a star, and travel around the world teaching, or she needs to start a studio. Really what we’re doing is giving her the ability to be that owner, but without the studio walls and having to clean the toilet and mop the floors. She won’t have to deal with, we just talked about, starting a business. Starting a business is really hard. If we can give them the tools to do what they do best, which is teach and inspire, then they can forget about everything else. MR: As a fitness instructor, you’re not schooled in running a business. You’re not schooled in finding space, most of these folks haven’t worked at Apple, they don’t have, they’ve been career fitness folks, I imagine, that makes it even harder to start your own fitness business. MR: And yet, so many do. HS: So many do. I think when many of them get into it they realize that they’re spending, we just talked about what I had to spend my time doing when I started which is, getting snacks, and setting up internet, all of these things. I think when they get in there they realize that they’re spending over half of their time doing the administrative stuff and very little time actually teaching. Which is what brought them there to begin with. MR: How are you going to solve that with the MoveWith platform. HS: We’re basically creating a studio digitally. Where all of their followers live right there. Anywhere that teacher is teaching, anyone that follows that teacher will know. We’re giving her all of the tools to create classes, to do the accounting, and the business practices so that she doesn’t have to think about all of the operation aspects of this business. MR: Who gets to decide what class it is, when it is, where it is, how much to charge. HS: It’ll be a bit of both. The advantage of being a tech company is that we can start to get data at scale. We can start to help them understand what should the pricing be, where is the demand, where, if someone wants to do a run yoga class, where is the best place and time to do that. Our product, over time, will start to help them do that. They want to innovate. We’re going to let them do that too. Within a frame that makes sense for the consumer. MR: Given the growth of these independent studios there’s been another trend, which is the class pass. Living in New York City, I hear and see a lot about class pass, which is, all you can eat for $100 a month you can go to a number of studios. I think, there’s some caps on how many times you can frequent the same studio. What’s your read on that trend, how does that fit into with what you’re trying to do with MoveWith. HS: It’s clearly exploded at the consumer level. All you can eat for $100 is a great value. I think once you actually get in there you realize you’re highly constrained, what’s happening is studios are giving up under utilized spots, that would otherwise be unfilled, which is clearly advantageous for the studio. It’s all on the promise that those numbers are going to become actual real numbers. I think often times that’s not happening. MR: I want to ask about one other topic, which is women in technology is, very much in the press, it’s been written about and talked about a lot. What’s your take on, obviously there are few women in venture capital in the industry we’re in, more so, I think, in operating companies. Still, very few relative to guys. What’s your experience been. MR: Did that really bother you? HS: It didn’t bother me. It’s just that I’m aware of it. HS: I’m not one to feel that I can’t do, my Mom, when I was 5 years old, put me on the boys baseball team, so that I would start from a very young age to know that I could do everything that boys could do. I’ve been that way since, I would jump off all the cliffs that they would jump off, and the bridges that they would jump off, it is what it is for me. I do think for women, the way that I pitch is, I don’t over promise, I’m very real. I have noticed the ways that I maybe behave differently throughout this process. MR: Do you find that other women in the tech ecosystem are more willing to help because you are sort of the gender minority and there’s groups that have formed, so forth. HS: I’m seeing more of that happening. Females founders forming groups. For me, I’m actually more just looking for any founder groups. MR: Any group therapy would be, given that you’re a lonely founder. HS: I also, in general, like the conversation to be comprised of people from both sides. I thnk it needs to be on both sides for there to be any change. MR: Your entire management team, correct. Is comprised of women. Which is pretty unique. HS: All but one. It’s really unique. It’s clearly very unique in the industry. It’s very unique for me as well. It dawned on me the other day, I was sitting in a room full of all women for the first time in my career in this industry where there are very few women founders, CEOs and leaders. It’s actually quite cool, I also have a female board member. Unintentionally, actually, I seem to be surrounding myself with women. MR: You’ve done a great job recruiting other women to MoveWith, what’s your advice on how to do that. To get more women in the tech sector and at these startups. HS: I actually think being a woman helps. It’s easier for me to talk to women that are going to gravitate to what I’m doing. That’s number one, so if I hire women and help recruit them. HS: It’s self fulfilling. I was not overly intentional about it, when I was looking for our head of technology, I was actively asking people they knew of any rock star female technology leaders. Not because I had to, I was going to hire the best person I could find. But there was something about starting a female executive team that was very exciting to me. Not only are we all female, but we’re all of different races, which is also very exciting. MR: Holly, thanks so much for coming. This was a great discussion, I’m very excited to not only be an investor in MoveWith, but I can’t wait for MoveWith to come to New York, so I can start using it. Anyway, thanks so much. MR: If you have a start up idea and you want to give this process a shot, reach out to us at info@foundercollective.com. You can also follow us on twitter at @fcollective or you can follow me directly at @MicahJay1. If you like what you hear, please subscribe on iTunes and leave a nice review. Here’s a clip from the next episode.